God had told Adam and Eve, "Multiply and replenish the earth." It was an oncoming thing, a promise. She was not his wife, as yet, because he had never lived with her. The bride of Christ is not His wife yet. The Wedding Supper is to take place. Get it? Notice, oh, this is rich. She got in a hurry, and what did she do? 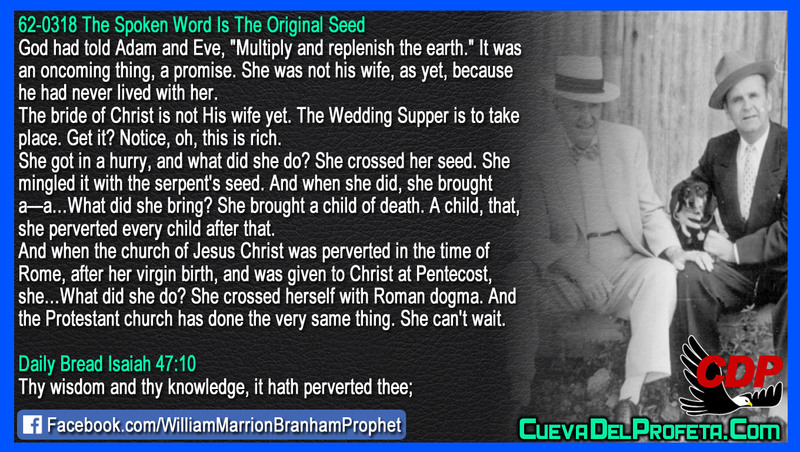 She crossed her seed. She mingled it with the serpent's seed. And when she did, she brought a—a…What did she bring? She brought a child of death. A child, that, she perverted every child after that. And when the church of Jesus Christ was perverted in the time of Rome, after her virgin birth, and was given to Christ at Pentecost, she…What did she do? She crossed herself with Roman dogma. And the Protestant church has done the very same thing. She can't wait.